SAN DIEGO (23 March 2006) — The organizers of the World Baseball Classic knew they’d hit on a winning formula the second Team USA was eliminated from the event and Alex Rodriguez talked for 45 minutes about what he’ll do differently in 2009. 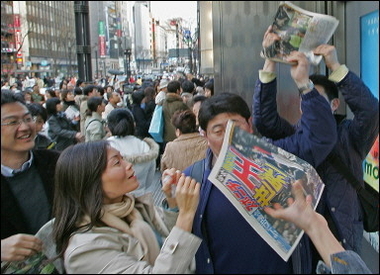 TOKYO (22 March 2006) – (AFP) JAPAN heaped praise on its baseball team for its come-from-behind victory in the World Baseball Classic and called for a bigger Japanese say in the US-dominated sport. 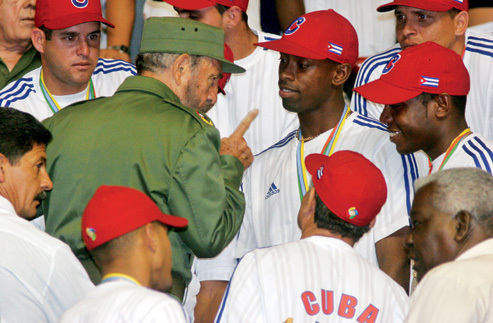 Fidel Castro with Leslie Anderson and Cuba’s national team in 2006. Photograph by Sven Creutzmann/reportage by Getty Images. CUBA is to donate its earnings as runner-up in the 1st World Baseball Classic to victims of Hurricane Katrina in the southern United States, reaffirmed President Fidel Castro at the end of his welcoming speech to the brilliant Cuban team. San Diego, Mar 21 (Prensa Latina) – WITH its showing in the World Baseball Classic, Cuba hopes that baseball is reinstituted in the Olympic Games, starting with the London Olympics in 2012. SAN DIEGO (Monday, 20 March 2006) – WHAT WE ARE WITNESSING is nothing short of a conquest if not an outright theft of a national pastime. They have turned major-league millionaires into paupers on the baseball field, and tonight, in a city that bills itself as “America’s finest,” despite a fiscal crisis that has left it broke, Cuba can record a win for the ages. In the shadows of the U.S. Pacific Fleet and in a state that was the magnet for America’s westward expansion, Cuba will play Japan in an improbable final game of the inaugural World Baseball Classic. The final, set up when Cuba beat the Dominican Republic 3-1 and Japan shut out bitter rival South Korea 6-0 at Petco Park on Saturday in a day of baseball that drew a total of 83,907 fans, validates the legitimacy of the WBC. It has also answered a riddle about how many members of the Major League Baseball Players Association it takes to hold a WBC final? The answer, in 2006 at least: two – Japan’s Ichiro Suzuki and Akinori Otsuka.